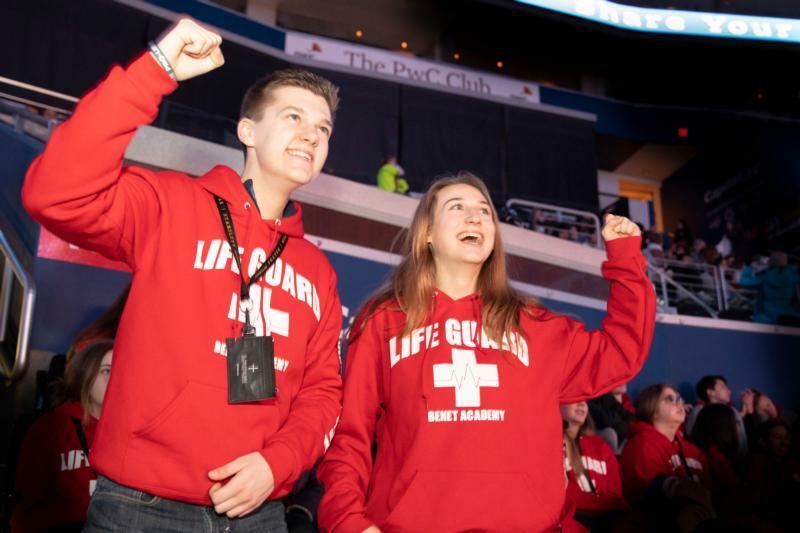 WASHINGTON (CNS) — Discovering who had traveled the farthest to be at the Archdiocese of Washington’s annual Youth Rally before its Mass for Life quickly became apparent by scanning the crowd of young people near the stage at the Capital One Arena. Among the estimated 18,000 people in the arena was Monica Pazniewski, waving a life-sized inflatable yellow plastic kangaroo with green boxing gloves. She had journeyed with a group of about 120 young adults from Sydney, Australia, who stopped in Washington to join the March for Life Jan. 18 before continuing on to World Youth Day in Panama. Next to her sat a fellow Aussie, Sarah Alimangohan, who had small temporary tattoos of the Australian flag on both sides of her face. The young woman, also 23, recently earned her degree in fashion and textiles. “I want to stand up for the voiceless,” and for “the truth that there’s beauty in our lives,” she said. Also near the stage were students and teachers from St. Mary’s School in the Washington suburb of Rockville, Maryland. At the Capital One Arena, the Washington Capitals’ red 2018 Stanley Cup banner honoring the championship hockey team hung from the rafters. Many of the students participating at the rally wore colorful matching hats or sweat jackets. In one section, 60 students from the Academy of the Holy Cross in Kensington, Maryland, wore matching purple knit caps displaying the words “AHC FOR LIFE,” and many wore pullovers or sweatpants also displaying their school’s colors. “We all here believe in the dignity and value of every life, and we support and advocate for those who don’t have a voice yet,” said Cecilia Rogers, a senior at Holy Cross. The speakers at the rally included Obianuju Ekeocha, the founder and president of Culture of Life Africa, an initiative that promotes African values of sanctity of life, the beauty of marriage, the blessings of motherhood and the dignity of family life. Ekeocha encouraged the young people to stand up for life at their schools, in their families and with their friends. Noting that she studied microbiology in Nigeria, she said scientific facts about the development of the unborn child show that being “pro-life is pro-science,” which was the theme of the 2018 March for Life. The message board ringing the arena’s middle section encouraged students to use #Mass4Life or #iStand4Life or #WhyWeMarch to use social media to promote their pro-life stance, and many students held small placards with those hash tags. Sister Maria Juan — a Religious Sister of Mercy of Alma, Michigan, who was an emcee at the rally — led the crowd in a pro-life rap and then started a wave that cascaded through the arena, with young people jumping up and waving their arms in unison, section by section. “I’ve always wanted to start the wave!” she said. Filling up one corner section of the arena were about 150 students from Benet Academy, a Benedictine school in Lisle, Illinois, who wore matching red hooded sweat jackets with the words “LIFE GUARD” emblazoned on the front. They had made a 15-hour bus ride to attend the rally, Mass and march. His classmate Caroline Rotkis, who turns 18 in February, was attending her first March for Life. “As a woman, I don’t have to buy into the lie that abortion helps women. It hurts them,” she said. Both students said it was inspiring to be a part of the Rally for Life. “It’s absolutely insane to see this many fellow Catholics in one place,” said Rotkis.